On the 17th of January, 2017, Professor Akachi Adimora Ezeigbo agreed to meet with me and tell me her Biafran story. On the 23rd of the same month, I traveled to Abakiliki in Ebonyi State to interview her. I felt a bit apprehensive as I had never met her before, but my worry proved to be needless because she was very warm and welcoming. For almost three hours we had a very enlightening discussion. And when we were done, she opened a bottle of wine, and we drank to life and health. The first part of our discussion was published on May 30th, 2017. The second part is presented here in a question-and-answer format. VO – How did life eventually return to normal for you and your family? Queen’s school was destroyed. There was no refectory. The dormitories had no beds, so we placed mats on the floor and slept. Those from more comfortable homes bought mattresses. There were no books and you needed to have money to register for your School Certificate or the Higher School Certificate examination. My father, who had been in government before the war, was retired compulsorily because of his war engagement. Many others were retired like that. My mum sold some of her jewelry and wrappers, sometimes to wives of Nigerian soldiers, in order to raise money for our upkeep. Many women did the same. Sometimes she sold fruits, for any money that came in was useful. Even to pay for my external examination was difficult. When my father eventually got some money – about twenty pounds – they picked his pocket at Onitsha Motor Park. Luckily, one of my teachers in secondary school, an Anglican missionary who had left Port Harcourt when the war started, sent ten pounds to me for the exams. She was very good to me because she saw the potential in me and had told my father I was university material. Else, I would have been married off after the war as many girls were. The thing is, when children have potential it’s good to nurture it. A lot of people came to marry me after the war and my father was criticized by his relations for sending his daughters back to school. But he persisted and in 1971, my sister and I got federal government scholarships purely on merit. This was in spite of the fact that we had just emerged from the devastation of a terrible war. I was even informed that my HSC result was one of the best in the country. It was amazing when the two scholarships came. That’s how we were able to go to university. My father couldn’t have coped. My parents are late now. My sister eventually became the first professor of Mass Communication in Nigeria. Her name is Chinyere Okunna and she served in Peter Obi’s cabinet as his Chief of Staff, Commissioner for Budget and also for Information. 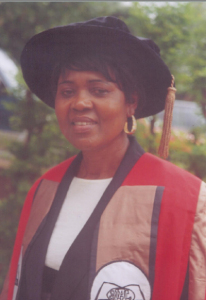 She’s now the Dean of Social Sciences at Nnamdi Azikiwe University, Akwa. One of my brothers worked in Shell and took an early retirement to live with his family in Canada. My youngest sister lives in US with her family. The one who was shell shocked is a business man. One just retired last year from the Federal Ministry of Education. Yes, we survived the war as a family in spite of our losses – human and material. VO – What did the deprivation, constant displacement and other traumas of war do to you? AAE – What the war did to me was to make me a person whose heart was constantly palpitating, always worried and anxious about what will happen next. VO – Have you been able to overcome those feelings? AAE – Partially. It’s not as much as it was during the war and being a committed Christian has helped too. When I find myself in a painful situation, I pray and commit it to God. I have also become more mature with age and take things in my stride. VO – What else did the war experience do to you? AAE – It taught me that there is no situation that doesn’t have a way around it; that no problem is insoluble. You only have to think and decide what to do. Most importantly, death has been demystified. Dying doesn’t worry me anymore because I have experienced the death of many loved ones. VO – Most survivors I’ve spoken to seem to have adjusted so well psychologically and emotionally, in spite of all the traumas they experienced. I do not sense any bitterness in most of them. And it isn’t as though they went through therapy afterwards. What do you think accounts for this? Is it the much talked about Igbo spirit or a hardiness peculiar to Nigerians as a people? ANSWER – Maybe it’s a Nigerian thing but most of all it’s the Igbo spirit. Igbos are very optimistic and nothing can keep them down. No matter how bad a situation is, they hope it will get better. Even the twenty pounds they gave to people after the war didn’t get to my family. My father went a number of times but the crowds were so much he decided not to depend on it. My mother never bothered. She had been a successful business woman and had a lot of money in the bank. This was the experience of many families. Yet people survived. They started struggling afresh and bounced back. VO – What was your own personal journey to healing? AAE – As a secondary school girl, I had written my first novel, “Tainted Custom”. Even at that time I didn’t know much about creative writing but I had a literary ambition. I still have the manuscript and even though it hasn’t been published, people conducting research about my work or phases in African writing usually ask to examine it. Also, after the war, I told myself I was going to write about that terrible experience. And my PHD thesis was the first thing I wrote about the war. It was based on the literature of the Nigerian civil war and published as a book in 1991. Its title is Fact and Fiction in the literature of the Nigerian Civil war and it explores the fictional accounts; the non-fictional accounts written by the generals; the speeches by Odumegwu Ojukwu and Yakubu Gowon; the books by Green, Forsythe, Uwechue, Mezu, etc, and, of course, other imaginative literatures on that war. While writing that thesis, I was weeping. I was remembering my own experience and all those children who died of Kwashiokor. Roses and Bullets is the latest book I have written on the war. I don’t have any pain any longer. It has become totally purged and I only look at it as a historical experience which I have learned some lessons from. I have another novel, Children of the Eagle, and a short story, The war’s untold story. So, writing was a purgation and very therapeutic. VO – Do you think enough literature has come out of that crisis? And what do you think about the quality of what has been written? AAE – If there’s any aspect of Nigerian history that has been properly documented in writing, especially literature, the Nigerian civil war is the one. There’s been so much in terms of books, novels, short stories, plays, poetry collections, memoirs and essays. Chinua Achebe, Wole Soyinka, Cyprian Ekwensi, Gabriel Okara, John Munonye, Elechi Amadi, Femi Osofisan, Chimamanda Adichie, Ben Okri, Mabel Segun and her daughter, Omowunmi Segun, Kole Omotosho and many others have all written works based on the war. More books are still coming out. People have been organising conferences and seminars about the war. Some are collecting eye witness accounts such as the one you’re working on now. VO – Do you think this body of work truly represents the narratives of that war? AAE – Yes, especially because people are writing from different perspectives – gender, historical, political, pro-Biafra, anti- Biafra, and so on. VO – Are people reading these works? Do people even know they exist and if they do, are they easily accessible? AAE – Nigerians are not reading enough. I am in the habit of asking people if they have read certain books I feel they ought to have read. So I mention a title and ask, “Have you read this book?” and the response will be, “No, I haven’t.” “How could you not have read this book?” I ask further. It’s disheartening. The reading culture in Nigeria is nothing to write home about. VO – Let’s go back to the post-war years. In your opinion, how did the war affect the Igbo society, culturally and otherwise? AAE – In the pre-war Igbo society, there was a lot of honesty, integrity and hard work. But the war swept away our culture, our values and morals. Many young men went into armed robbery. People had become extremely poor and Biafran money was useless. Even the twenty pounds they promised, how many got it? It was also at this time they declared the indigenisation policy where other ethnic groups bought shares in companies as foreigners withdrew. Most Igbos didn’t have money to make such investments and that is the root of the lack of industrialization we see in our society, for example. We also had more Igbo women becoming promiscuous. Some went away with soldiers just to survive. Only few families who were working and receiving salaries were able to send their children back to school. VO – The Afia Attack was very important during the war because it ensured that supplies of scarce commodities found their way into Biafra which was blockaded by the Nigerian government. Many of the traders were women because many adult men were either fighting in the war or in hiding. Some people have said that this helped to set the Igbo woman on the path of becoming more emancipated, assertive and business minded. Do you think this claim is correct? Again, in what ways do you think the Afia Attack affected the women who took part in it? AAE – I don’t agree with that assertion because Igbo women have always been very vibrant traders. N’obodo anyi, onwere ihe a n’a kpo ‘o jebere afo lo nkwo.’ It describes women who go to trade in other towns and return home after several days. These would be mature women who didn’t have babies or young children at home. This was also one of the reasons men were polygamous so that when one woman is not there, another will be. My mother was an astute business woman in the 50’s and 60’s. Even in the early traditional agrarian societies, when a man was planting yam his wife would be planting cassava or melon seeds or vegetables. So Igbo women have never folded their hands in idleness. However, what the Afia Attack might have done was to open women’s eyes to wider circles and types of businesses. But it was not the catalyst. And again, some people have said it affected morality because some of these women were said to have been sleeping with the soldiers they met on the way. Others were no longer willing to subject themselves to being wives, preferring to live independently and make their own money. This is the impression you get based on the literature that has come out of that war such as Buchi Emecheta’s Destination Biafra or Flora Nwapa’s Never Again. You’ll also see that in Cyprian Ekwensi’s Survive the Peace, where a woman called Juliet abandoned her husband and went into business.